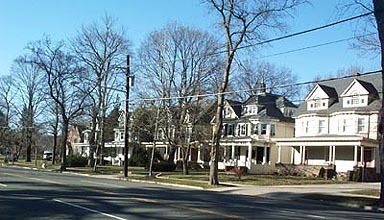 Berkeley Square, is an early example of a planned suburban community. In the late1800’s, the Cadwalader Estate, completely undeveloped rural land, was subdivided and provided with what were essentially urban amenities at the time, sewers, paved streets, gaslights, and city water. The building lots were then sold to middle and upper middle class families eager to escape the high density, crime, pollution, and other ills of urban life. The development of rapid public transport, namely trolleys and shortly thereafter the private auto, allowed families to live outside the city while commuting daily to jobs in the inner city. 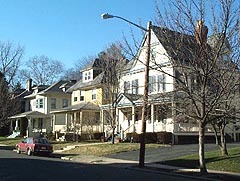 This basic pattern of suburban life was a dramatic break with past patterns of American life, where a family either lived on a farm or small village or lived in the city. 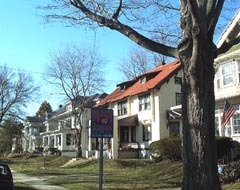 The introduction of the concept and possibility of “suburban” living signaled the beginning of a new type of American life that has dominated the present century. The Berkeley Square area is an excellent example of the beginnings of suburbia, an important facet of American culture. The Berkeley Square area as a whole is an example of what could be broadly defined as late “Victorian” architecture. The variety, quality and blending of architectural elements, such as patterned shingling, stained leaded glass, and decorated trim, distinguish the structures individually. The range of architectural styles, displayed on structures built within the same decade, demonstrates the eclecticism of turn-of-the-century taste. While the individual “Victorian” structures show the range of elements combined in a single building, the Berkeley Square area taken as a whole is an excellent example of how this eclecticism was expressed on a community-wide level.